Skype users can finally rejoice as the app is updated to allow VOIP calls over 3G. However, it’s not all rosey with this new update as Skype plans to charge a “small fee” for calls made over the 3G network. First, the good news: call quality is superb over 3G network. Unlike many other VOIP apps that have permitted 3G calls, Skype actually took the time to make sure the call quality was also there. We tried a few test calls using Skype over wifi and 3G and found that call fidelity was nearly matched over the two networks. Now for the bad(?) news. Skype has plans to charge a “small fee” for using the service over the 3G network (see screenshots for in-app disclosures). The requirement for a “mobile subscription” won’t be required until (at the earliest) August 2010 end of 2010 but it is coming. The in-app disclosures state that wifi calls will remain free, the new fee only applies to calls over 3G. You may have seen other apps offering calls over 3G, but we’re holding ours back for a little bit longer. Why? So that we can give you the very best audio quality we can. When our 3G-capable Skype for iPhone app is released, it’ll let you make calls in wideband audio, giving you greater clarity and fidelity – because that’s what you expect from Skype. 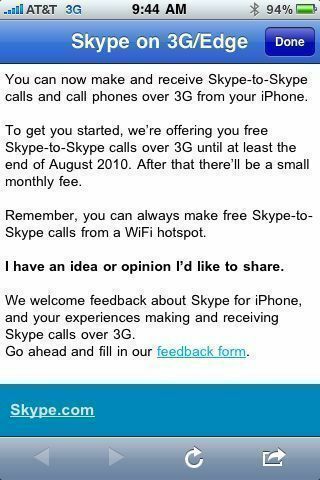 So, why charge a fee at all for using Skype over 3G? We’re not sure, but if I were to speculate I’d say there are probably a number of reasons. The first of which is that Skype knows that with calling over 3G possible that users will lower their minute plan with their carrier, this is an opportunity for them to get a piece if that pie. Also, we know that Skype put some effort into ensuring call quality over 3G was good. It’s possible they are recouping some of those development costs. 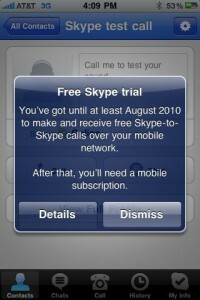 Lastly, it’s possible Skype is treating the 3G network capability as a premium service. 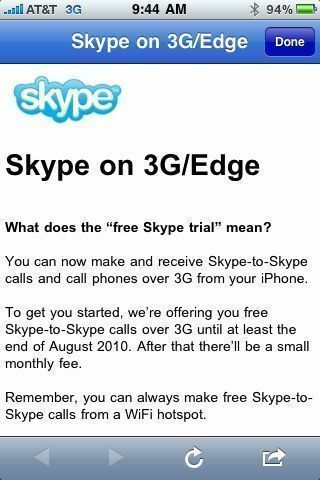 However, whatever the reason for the small fee to use Skype over 3G, let’s hope it will be cheap! - Call using your 3G connection. Skype-to-Skype calls on 3G are free until at least end of August 2010 end of 2010, after which there will be a small monthly fee (operator charges for data will still apply). Looking to travel with your iPhone and need VOIP for cheap phone calls back home? This is how I did it traveling outside of my home country. Update: Newly updated information on the upgrade app indicates that Skype has decided to delay charging for Skype to Skype calls over 3G until the end of 2010 and not August 2010 as originally stated. I had a few requirements for when I was out of the country, mainly I had to be able to call the family and dial into work conference calls without incurring a huge roaming bill at the end of the month. So, in essence, cheap or free outgoing calls are critical while incoming calls I wasn’t as concerned for since I could take the call on roaming then call them back using the other method (and hopefully only incur periodic $.59 calls). Since unlocking your iPhone and using a SIM card from a carrier in the country you are visiting is out of the question (AT&T or Apple will not unlock your iPhone) I had to look at options that were available to me… namely VoIP. Apps for various VoIP services have been springing up all over the App Store and so surely there’s something there that would work. 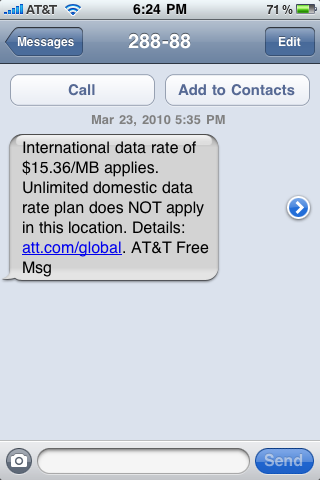 Remember, that using VoIP would require that I had some type of data connection to my phone (read: WiFi) since if you recall data roaming via cellular is $15.36/MB. (Note: there is a data roaming package that you can add from AT&T, prices start at $25.00 for 20MB and go up from there, but it’s still not a viable option for VoIP since you need roughly 5MB per minute for typical VoIP calls). I started to evaluate various services and apps about two weeks prior to leaving for Canada. I immediately removed several offerings by eliminating them based on my criteria. My requirements were: 1. It had to be cheap (free is better but not more than $10.00/month), 2. The service had to allow me to call any phone number in either Canada or the USA, 3. The service had to have excellent voice quality, 4. The service needed to be fairly easy to use. 1. I first started out looking at iCall (v.1.2.5). iCall is a free app and after installing it seemed to offer everything I was looking for in one easy step. Enrollment was easy and after I signed up I could instantly start dialing out to any phone number in the USA or Canada – for free! 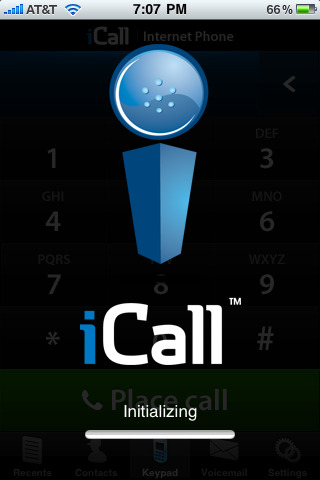 The iCall app kept track of my recent calls and integrated nicely with my iPhone contacts by giving me easy access to them. iCall also claimed that it could seamlessly transfer an in-progress cellular call to the iCall app, to help save on cell minutes. Sounds great, right? Well, almost. The free version will cut your calls at three minutes and before placing your call you must listen to a 30 second advertisement. So, free it is not. The paid, unlimited subscription is at the top of my tolerance at $9.95 per month and there is also a pay as you go option too. However, iCall had the poorest voice quality of any solution I tried with noticeable (and unacceptable) lag and pretty bad ‘robot’ voice transformation for those on the call. So, score for features, fail for quality. I did try this app multiple times (free version) both at home on a 15MB/sec Internet connection and on the hotel WiFi, both with the same results. I’ll add that the iCall app description (on icall.com) states that better call quality comes with the paid versions, but the free call quality was unacceptable and didn’t leave me feeling like I could take a chance on the paid version. 2. Skype. You probably already have a Skype account from a previous life so that significantly eases the installation and setup of Skype on the iPhone (if not, you’ll need to install the PC or Mac application to your computer to create an account). 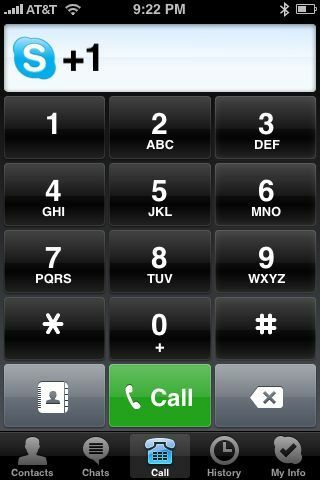 Once installed, the Skype app allows for easy integration into the iPhone contacts and includes a nice dialer. If you have Skype credit you can also send SMS from the app to anyone (find the SMS charges though on Skype.com). The app is the only one that didn’t work over 3G that we tested, however the service delivered the highest call quality by a landslide and worked flawlessly while on a WiFi connection. I subscribed to the cheap $2.95/month for unlimited SkypeOut calling (Skype to any phone number in the USA or Canada) and at this point I was set. Call quality was just amazing, as good as just calling over cellular. Once you have a Skype account, go to Skype.com and add SkypeOut by either adding credit or getting a subscription. From here you can also add a phone number (for others to call you) for $30.00/year and have unlimited inbound calls as well, but this wasn’t a requirement for me. There are also 3rd party apps that allow Skype over 3G (Fring and Nimbuzz are two) but both of these required their own accounts and then adding the Skype account to use them. Also, they were rather cumbersome to use and the only benefit over the actual Skype app was the ability to use Skype over 3G which was of no value while roaming in Canada. 3. FriendCaller Pro. 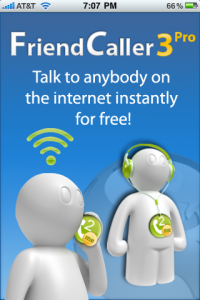 FriendCaller recently made all of their apps in the App Store free. So I installed the Pro version. FriendCaller let’s you pay monthly or buy blocks of minutes in $5 increments. If you’re not looking for a monthly subscription then this one is an option. Unfortunately, as I was looking into others I didn’t get a chance to fully test FriendCaller’s features and quality since they did not have a free option to try, so I can’t comment on it beyond the installation, sorry. There are a whole host of SIP apps in the App Store, I did not try any of these since they required I went and found a SIP provider as well. Unless you’re already using one of these providers then I’d stick to one of the easier solutions above. The real winner here for me was Skype. As cheap as Skype is ($2.95/month for unlimited Canada/USA calling) and for their excellent call quality even on the limited bandwidth hotel WiFi made Skype a real winner. One of my colleagues even asked me how to get it all setup so that he too could take advantage of the low-cost calling to his family. If iCall could get their call quality as good as Skype then I believe they too have a very interesting solution, one where simplicity of setup and ease of use is key. 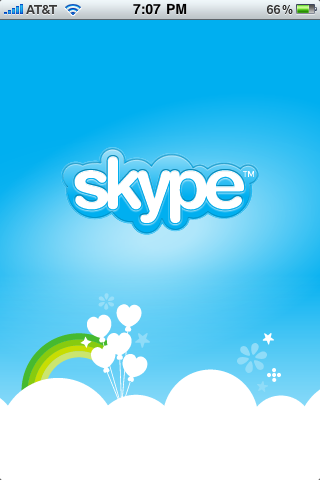 I wish I had tried FriendCaller more and I may just do that next time I travel, but for now I’m sticking with Skype. A few other tidbits: I took an Apple Airport Express so that my iPhone had WiFi in the room. Many hotels only have wired internet in the rooms so you’d either need a notebook and setup an adhoc network or go down to the hotel lobby to get your iPhone connected so just know that you need WiFi. 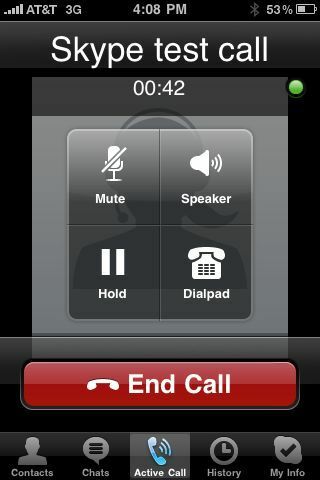 Next, for incoming calls I just had people call my cell phone, then I called them back on Skype to get the cheap calls. This worked for me since incoming calls on any VoIP app on the iPhone will not ring unless the phone was charging. Even those with Push Notifications were spotty at best (hence, completely unreliable). Lastly, most of your calls to other people will show up as Unknown or Unavailable or in the case of Skype as “000012345.” This may throw people off so either warn them or you can have Skype show your cell phone number (Skype credit and setup required). In all, using VoIP while in Canada worked excellent for me. WiFi was available in nearly every part of the hotel, conference center and even most restaurants and places of interest that we visited so finding WiFi to make a call was seldom a problem. If you’re about to travel outside of the U.S. (or your own home country) then it’s time to consider VoIP on your iPhone – if you already haven’t done so. 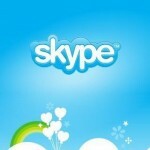 App Review: Official Skype App Released, VOIP For Everyone. The official Skype app for iPhone was released yesterday with much fanfare around the interwebs. So we took the app for a little test drive. Upon launch you are presented with the typical Skype list of contacts. From here you can select a contact from the list and initiate a chat conversation or voice call. When you select the “Chats” button, you will be given all open chat windows. The “Call” button allows you to make a call to any US phone number (Skype Out), providing you have purchased Skype credits. Our call tests revealed that the app worked very well. We called a computer from an iPhone and then we called the iPhone (app running on an iPhone) from an iPod Touch 2nd Gen (headphones with mic required). The app was responsive and voice quality was excellent in all circumstances. In all, we were very impressed with the quality of the calls for Skype to Skype calling. While we never tested Skype to land line phone calling, we assume that it’s quality is also excellent. If you’re not familiar with Skype, calling a real phone line or receiving calls from one requires Skype credit and then calling rates apply. Unfortunately, under the current iPhone firmware there is no receiving calls unless the app is running (background notifications, anyone?) and VOIP calls are not supported over cellular data connections (EDGE/3G). So, you will have to be on a WiFi network to send or receive calls. However, 9to5mac.com claims that under iPhone OS 3.0 that VOIP calls indeed do work over 3G and states that the call quality (3G to 3G) may even surpass AT&T’s. They have a video posted to show the app working over 3G on OS 3.0. In all, we’ve been pretty impressed with the Skype app. It works great on our iPhone and 2nd Gen iPod Touch and is a great addition to our permanent apps list. 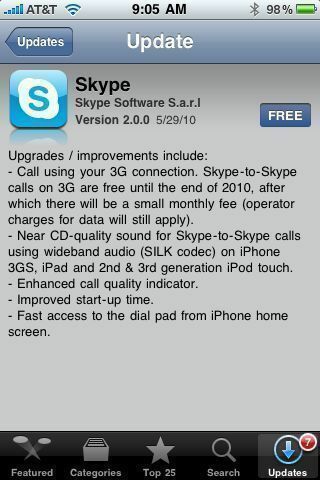 Skype is FREE in the iTunes App Store.